You know how you get a “volume discount” when you buy a 400-foot long hose at Sam’s Club? Or a giant box of crackers? Kind of makes sense. But this is how abusive debt collectors think — they believe the more times they break the law the less they should be sued under the FDCPA (Fair Debt Collection Practices Act). And when they are sued, they want a “volume discount” because they have been sued multiple times. One of the dumbest things but it is amazing that they say this with a straight face. How about you stop breaking the law? And instead of a discount, should there not be extra money paid in each settlement because they are repeat offenders? Habitual offenders? Seems that way to me! 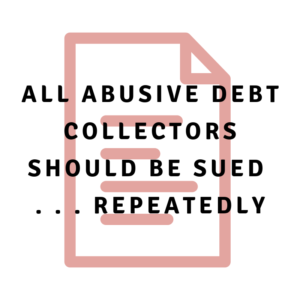 Why should abusive debt collectors be sued under the FDCPA? It gets their attention. We’ll talk more about this below. What happens to you when you sue abusive debt collectors under the FDCPA? It stops that collector from collecting against you on this debt. First, because you are represented by a lawyer so they are not allowed to contact you. Second, because it is incredibly stupid to continue to collect against you when they have been caught breaking the law. Third, you are entitled to compensatory (actual) damages (including emotional distress), statutory damages, and even punitive damages under state law. What happens to the abusive debt collector when it is sued? It is a wake up call to them. Now they know they have been caught. They will have to pay their own lawyer and most likely your lawyer. And have to pay you damages. We have had debt collectors act abusively over $600 and end up paying six figures in damages. How do multiple lawsuits impact the industry of debt collection? It changes the cost benefit calculation. I know we are breaking the law. That’s fine. It makes us a lot more money or we would not be doing it. But if we start getting sued too much and we can’t convince the judges that we should get a discount for breaking the law so often, it will no longer be profitable. We’ll have to start obeying the law. And when they obey the law, it makes it a fair market place for the debt collectors who stay within the law. So when you sue — and sue and sue — it makes the industry slowly but surely get better. Now, the abusive ones are crafty and will always try to figure out a new way to cheat you. Learn your rights and take action including suing abusive debt collectors! So to do this you need to know your rights. Understand your options. But knowledge is not enough. We have to mix action in with knowledge or the knowledge is worthless. So find out your rights and sue these guys as many times as you can. PS — If you want us to help you think through your options, call us at 205-879-2447 or fill out our contact form and we’ll get right back with you thanks!